Every parent knows that strong reading skills are an important factor in their children's success at school and in life -- but getting children to love reading isn't always the easiest thing. Some kids are like my daughter, who seemed to love reading from birth; there wasn't much we needed to do to get her to love books and set her on the path to reading. My boys, on the other hand, loved listening to stories but never seemed to be interested in reading on their own. Only recently have they begun reading, not because their teacher asks them to read 20 minutes every day, but because they want to. Some readers are born, and others are made. The good news is that there are things you can do to instill a love of reading in your child! Read to your child at an early age, and often. Make it a ritual that you and he/she can share. Point out words and signs on the street, in stores, in every day life. Read on your own to show your child that you love reading too. Give your child the opportunity to choose the books that interest him. You'll be well on your way to raising a lifelong reader! This fall, Kellogg's, Scholastic and Walmart have teamed up to give families a fun, easy way to bring books into the home with a great new program. 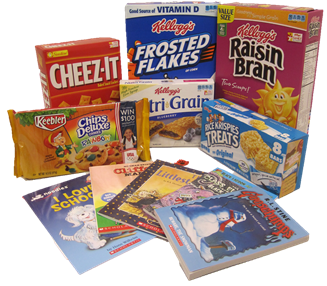 Since nine out of ten children say that they are more likely to finish books that they choose themselves, Kellogg's is giving you the opportunity to choose a free Scholastic book! Just purchase specially marked Kellogg's products at Walmart stores, collect the codes found inside the boxes, enter the codes at KelloggsFamilyRewards.com/Scholastic, and you'll receive a $5 coupon towards a free Scholastic book. Kids can choose their free book at http://www.scholastic.com/kellogg/family. It's that easy! One lucky Bonggamom Finds reader will win a prize pack from Kellogg's that includes yummy Kellogg's products and great Scholastic books. Leave a comment on this post and tell me your kid's (or your) favorite children's book. I entered the Kellogg's & Scholastic giveaway! This giveaway ends at 11:59PM PST on November 20, 2012; I will draw a winner at random on November 21 and post their name after they confirm acceptance. Continental US and Canada residents only. For additional giveaway rules, click here. Disclosure: Kellogg's is providing the giveaway prize pack as well as a second prize pack for me. . The views and opinions expressed here are my own. 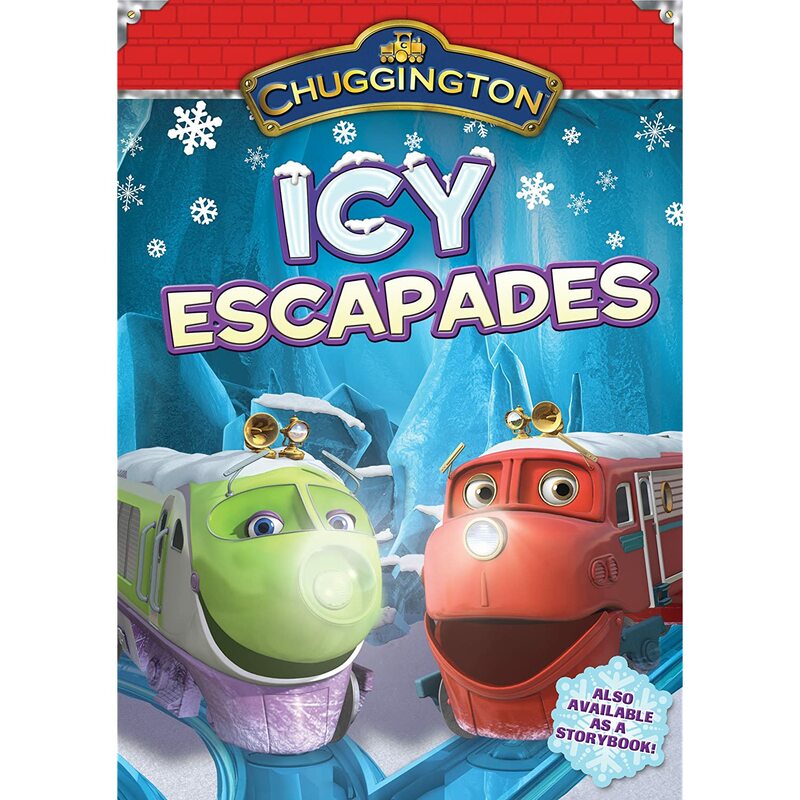 One lucky Bonggamom Finds reader will receive a copy of Chuggington's Icy Escapades DVD. Leave a comment on this post and tell me your kid's (or your) favorite Chuggington character. I entered the Chuggington DVD giveaway! Disclosure: I did not receive a sample or monetary compensation for this post. Product information (in italics) and the giveaway prize are provided by Grand Communications. The views and opinions expressed here are my own. They often have special services like gift wrapping or personalized toy recommendations from the staff. They often host community events like story times or school fundraisers, and participate in other community events like Downtown Easter Egg hunts or Halloween Trick or Treats. They reinvest their profits locally. They tend to carry many of the high-quality, boutique and specialty products that may not be in larger retailers. Check out the Toy Buying Guide and annual Best Toys Guide at YourNeighborhoodToyStore.org, the new website of ASTRA, the American Specialty Toy Retailing Association. They feature some amazing, unique toys you can find at your neighborhood toy store, like Tobbles Neo, a completely different kind of baby stacking toy, Zoob, a fun construction set, Tenzi, a frenzied dice game, or LoopDeDoo, a fun twisty bracelet craft kit. Zoob is one of my kids' favorite building sets, and they've recently come to know and love Tenzi and LoopDeDo (thanks to ASTRA and Team Mom, who sent us both toys to try!). They are awesome! Families across the country will get the chance to celebrate the joys of play at their local toy store on Neighborhood Toy Store Day, which will be celebrated on Saturday, November 10. Participating stores will host fun activities like arts and crafts activities, live performances, games and more. What a great way to see how much fun shopping at a local toy store can be, and to kick start the holiday shopping season with your local community! Disclosure: I received Tenzi and LoopDeDoo product samples via Child's Play Communications. Information about Neightborhood Toy Store Day was provided by Child's Play Communications. The views and opinions expressed here are my own. Some parents bemoan the loss of simple activities and games to the ever-increasing reach of videogames and apps. Other parents are happy to let their children move with the times and join the digital world sooner rather than later. I say there's a happy medium -- apps and videogames can be fun, effective teaching tools, especially when they are complemented with activities in real life! Case in point: The Dr. Seuss Fun Machine app. It's a set of physical game tiles you can buy in stores that's designed to be played in conjunction with a free app that parents can download on their iPad, iPhone or iPod Touch. Young children can certainly have fun with the app on its own (it's fun to "pull" the digital lever and see random game tiles show up on the screen!) and they can certainly have fun with the game tiles (you can ask your child to find all the tiles with The Grinch, or all the tiles with a blue triangle), but the most fun and learning happens when you use the tiles and the app together. Matching: A Game Tile appears on the screen and kids challenge their memories to find the matching tile from the physical game tiles that have been laid down on the floor. Slap Down: A Game Tile appears on the screen and kids race each other to find the physical game tile and slap it onto the pile. Guess A Roo: Clues appear on the screen, and kids have to guess which Game Tile it is. In all games, kids "pull" a lever on the screen to bring up a new tile. Of course, the lever and everything else is wonderfully illustrated in the Dr. Seuss style, so kids feel right at home in the wacky world of Dr. Seuss. Unfortunately, the tiles don't actually interact with the screen or anything -- but it it still does a great job combining the interactivity of an iOS app with the reassuring feel of actual, physical tiles to play with. Preschoolers will love this game! This is probably the busiest, most jam-packed fall that I can remember. The kids have triple-loaded their schedules-- volleyball, dance and an assortment of school clubs for The Pea, plus piano, soccer and a school play for the boys. Even with carpools, I find myself having to drive kids to and fro every day, and two days a week we are out of the house till 7:00PM. With this hectic schedule, I barely have time to breathe, much less cook dinner! Of course, the kids would love it if we ate out on our Late Days, but frankly the cost is prohibitive, and by the time you get yourselves seated and served at a restaurant, it's already way too late. I've relied on pasta, ramen, scrambled eggs, beans on toast and frozen waffles far too often for my comfort, but I'm not ready to pull out the frozen pizza every time, so partially prepared dinners are a good compromise when there's just no time to cook from scratch. We love fresh salads, so I can pair that with a frozen lasagna, or warm up some leftover soup and serve it with frozen dinner rolls. The good news for busy parents is that Schwan's online grocery has a variety of options for fast, delicious fall family meals that don't break the budget. You can just pop Schwan's frozen dishes in the freezer and take them out on your overscheduled days. Microwave them or bake them while the kids are showering or doing your homework (and while you pop in that extra load of laundry! ), so you can all come together for a delicious meal. Schwan's sent me their list of Top 10 Foods for Fall, which really got me drooling. 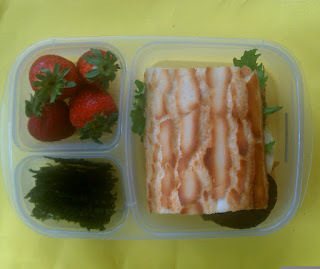 Lasagna Roll-Ups? Beer-Battered Cod? It would take me forever to prepare those! Hardwood Smoked Pulled Pork? Sorry, I don't have hours to spend watching the barbecue! To show me how easy and delicious their meals can be, they also sent me a box of Beer-Battered Cod and Hardwood Smoked Pulled Pork to try. We had them on two of our Late Days, and I must say, it was sooo nice to be able to sit down to a nice dinner at home without any fuss, or without any stress about the kids staying up past their bedtime! I warmed the pulled pork on the stovetop, added a dash of barbecue sauce, and served it between some toasted rolls with a side of coleslaw. Yum, the only thing missing was the Superbowl on TV. When we had the cod, I baked it in the oven (don't be tempted to microwave it, the extra time it takes to keep the batter crispy is well worth it) and used it as the main filling for fish tacos. Holy Yum. 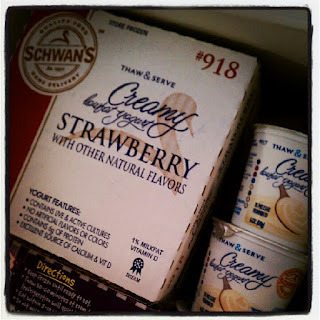 For dessert, of course we had Schwan's Thaw & Serve Creamy Yogurt. I've reviewed this product before, so I'm not surprised that it made their Top Ten Must-Have Fall Foods. You can store it in your freezer, so again, you can stock up and make sure you have some on hand for those hectic days, and it thaws to a wonderfully thick, ice-cream-like consistency. Just thaw them in your fridge in the morning and by nighttime they'll be the perfect after dinner treat. With dishes from Schwan's in the freezer, I can almost start looking forward to those hectic Late Days! All 3 of my kids are mad about stuffed toys, so we've got piles of them at home. Every year I try to downsize their stuffie stash, winnowing out the ones they don't play with and letting them keep their favorites. 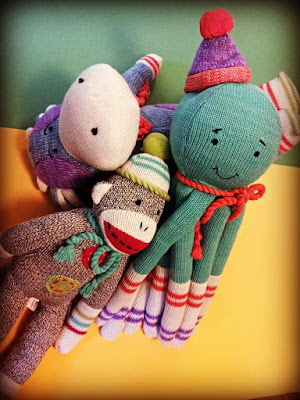 We recently received 3 adorable new friends that are sure to be in their favorites pile until they leave for college! 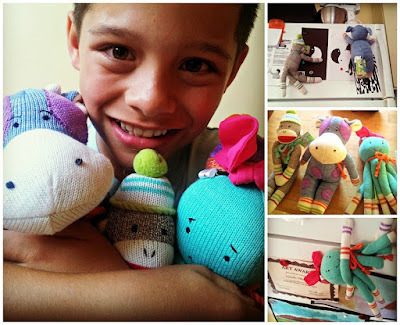 Meet Nelson (the monkey), Ozzie (the octopus) and Clover (the cow). They're part of the Monkeez Makes a Difference group of friends. 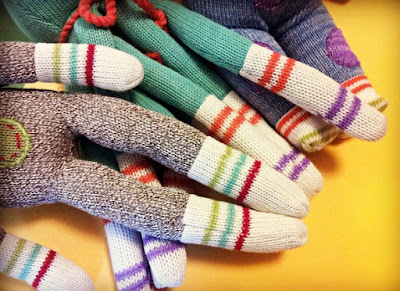 They are so soft and cuddly, made of knit material that feel just like your favorite pair of socks. They have a wonderfully whimsical look that's not too cutesy and not too cartoony. Their vivid colors and sweet expressions ensured that my kids would fall in love with them at first sight. They have magnets on their hands and feet, so you can put their hands and feet together. This allows for all kinds of fun positions. 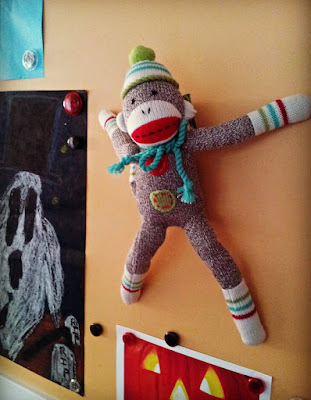 My kids like to make their Monkeez touch their toes, do some yoga, climb up the fridge, or monkey around on our magnetic board. I love how they're all wearing socks on their own hands and feet. What makes Monkeez more than just a toy is a special code on their product tag that triggers a donation worth 10% of the wholesale cost of goods to the charity of your child's choice. Your child can go to the Monkeez Island online site, enter the code, watch videos giving an overview of the charities. Then he or she can specify which charity to donate the money to. The charities are ones that kids can relate to, like Alex's Lemonade Stand and Best Friends Animal Society, so it's a great way to start a meaningful conversation about helping the less fortunate. What a wonderful way to introduce your child to philanthropy and help her feel like she's making a difference! If you're going to clutter your house with stuffies, these stuffies are definitely the ones to clutter them up with. Big thumbs up! Here's more information on Monkeez Makes a Difference. You can also visit their Facebook Page to learn more! Monkeez Makes a Difference gives children the opportunity to learn and practice giving back while having fun. It also provides an innovative solution to parents, grandparents and others who are hungry for tools to help them discuss and demonstrate what it means to think of others in today’s world. The fun and education starts with the purchase of a Genuine Monkeez and Friends plush character featuring a special Monkeez Makes a Difference tag, which are available at www.MonkeezAndFriends.com and at independent retailers across the country. There are more than 90 plush designs in multiple sizes to choose from in the program, including characters such as monkeys, owls, bears, lions, dogs, cats, pigs, cows, octopuses, panda bears, kangaroos, turtles, koalas, alligators, hedgehogs, elephants, hippos, zebras, frogs, bunnies and raccoons. New pint-sized pals are also part of the program, featuring smaller sizes, soft fabric and retail prices starting at just $8. Each specially marked character comes with a unique online game activation code on the tag. The products’ suggested retail prices range from $2.99 to $100, and are available at www.MonkeezAndFriends.com and independent retailers across the country. With an adult’s help, children follow the instructions on the tag and visit www.MonkeezAndFriends.com. There, they can enter the code and watch videos about each charity that partners with Monkeez Makes a Difference, including Alex’s Lemonade Stand Foundation, Samaritan’s Purse and Best Friends Animal Society. Children can select which charity they would like to contribute to, and Monkeez Makes a Difference donates 10 percent of the wholesale cost on their behalf. By selecting the charity of their choice, children unlock the door to an interactive and educational online world. Children can revisit www.MonkeezAndFriends.com as many times as they’d like to play educational games and learn more about what they can do to help others. Disclosure: I received a product sample to facilitate my review, but have not been paid to review the product or give my opinions. Product information (in italics) was provided by Monkeez Makes a Difference. The views and opinions expressed here are my own. 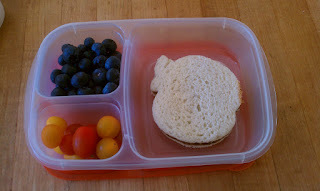 I stopped using plastic sandwich bags to pack my kids' lunches in several years ago -- plastic takes up so many valuable resources to produce, and it clogs up landfills. I'm never sure whether all the soap and water I use to wash reusable containers actually cancels out all the good I'm doing by avoiding disposables, but I've grown so accustomed to reusable containers that using plastic bags now seems wasteful. The bottoms nest into each other and the lids stack flat, so it's a real space saver. This is the biggest advantage for me, and the main reason I've abandoned all my other containers. I have 8 of these babies, and they all fit into a single drawer! Now my 3 kids and my husband can each be using 1, and I still have 4 spare containers at home. There are 3 compartments so you can pack a variety of foods without getting them all mixed up. 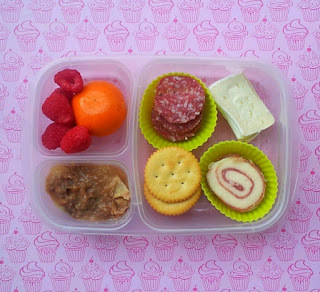 The biggest compartment is big enough to fit a sandwich, and the 2 smaller compartments are perfect for cut-up fruit, veggies, crackers, and all the bite-sized goodies that kids love. The bottoms and lids are dishwasher and microwave safe, which is extremely convenient. However, I find that the bottoms take up too much space in the dishwasher -- 1 bottom takes up the space of 3 or 4 dinner plates -- so I end up washing by hand. 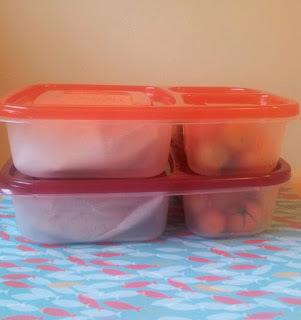 I don't usually pack hot foods or staining liquids like ketchup or tomato sauce, so the containers are super easy to clean. The main complaint I've read from user reviews on Amazon is that these containers are not spillproof, i.e. don't put salad dressing or soup in any of the compartments because everything will run into each other and spill out. 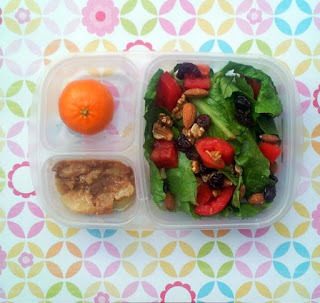 It doesn't bother me too much since I usually stick to dry foods or foods with minimal liquid (i.e. fruit). I never pack soup for lunch anyway, and I use small cups with lids for ketchup, peanut butter, hummus, mayo, salad dressing or anything runny. Check out the What's for Lunch this Week? 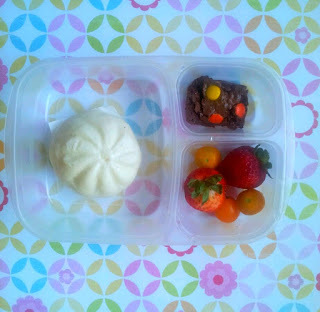 series on Finding Bonggamom for more lunch ideas! Disclosure: I did not receive a sample or monetary compensation for this post. Yes, I actually do feature products on my review blog that I've discovered (and paid for) on my own! The views and opinions expressed here are my own. This one is very traditional, but still very eye-catching. The vivid colors really capture the spirit of the season! I love photo cards that bleed right to the edge of the card. 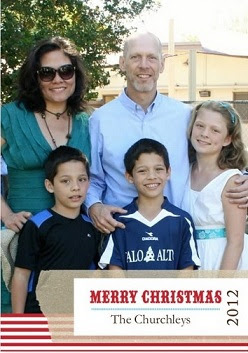 That way, your family photo is front and center, with nothing to distract from your beautiful faces! The greeting is superimposed on top of the photo for a nice modern touch. It took me a while to decide on which photo to use -- but if you can't decide, no worry! 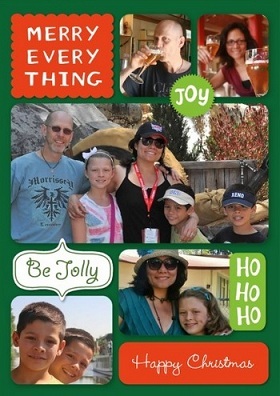 Shutterfly has layouts with multilple photos, so you can include all your best shots! What's more, you can customize the layout of every single panel of your holiday card -- the cover, the inside and the back. You can add text, photos or both! 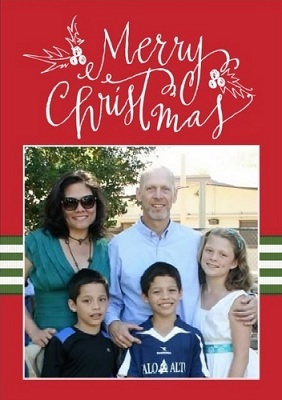 I love this feature because it means I can include our annual newsletter on the card without having to print it all out on a separate sheet of paper (plus, I get to show off more family photos). There are so many cool designs, it's difficult to choose! Fortunately, you can order single cards, or cards in multiples of 5 (and the price per card goes down when you buy larger quantities), so you can order a variety of designs. Speaking of prices, you can lower your order cost even more when you take advantage of Shutterfly's special offers -- check out their special offers page at http://www.shutterfly.com/special-offers to see what kinds of deals they have going. 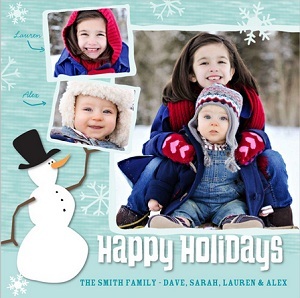 Order your holiday cards from Shutterfly ASAP -- that's one less thing you have to worry about for the holidays! Do you know someone who has battled, or is battling breast cancer with strength and dignity? There's still time to nominate her as a Pink Power Mom! Think globally, act locally: this is the concept behind the Pink Power Mom program, which is now accepting nominations for its 2012 contest to select eight deserving moms in local communities throughout the U.S. The program, part of the Kids II Foundation, honors mothers who are breast cancer survivors and powerful role models in their community. The Kids II Foundation was created by the company to make a difference in the lives of children and families in the areas in which employees work and live. Its largest and most impactful initiative is the Pink Power Mom program. Pink Power Moms are inspirations to their families, friends and others battling breast cancer because of their resilient spirit and perseverance in the face of adversity. Every year, Kids II celebrates eight mothers who have battled breast cancer and dedicated themselves to helping others in the fight. Friends and families are invited to nominate a mother who has been an inspiration throughout her battle with cancer. This year marks the first time the program will be open to self-nominations from those who believe they should be a Pink Power Mom. Submissions are now open and will be accepted through Oct. 31, 2012. To nominate a mom or yourself, go to www.pinkpowermom.com. Each of the eight women selected as Pink Power Mom will receive $5,000 for the breast cancer charity of her choice as well as a weekend of pampering, education and luxurious gifts. Each mom will also receive a legacy donation of $1,000 each year for the next four years. Disclosure: I did not receive a sample or monetary compensation for this post.Program information is provided by Kids II via CMM PR, and is indicated in italics. The views and opinions expressed here are my own. Energizer's commitment to Breast Cancer Awareness is strong, consistent and long-lasting: just like their batteries! They have donated over $3 million since 2005, and have partnered with the Susan G. Komen for the Cure foundation since 2007. This year they donated $225,000. I will be forever grateful to Energizer for sponsoring me in the 2010 3-Day for the Cure in San Francisco and giving me the experience of a lifetime! In fact, my experiences during that event and the people I met there are what inspired me to start blogging for Breast Cancer Awareness in October. So thank you, Energizer, for helping me see the world through rose-colored glasses! * During Valentine's week, Cinderella's and Sleeping Beauty's castles will be bathed in red and pink. * During Independence Week, the parks will salute America with a 4th of July Fireworks party that lasts all week. * During “Long Lost Friends Week,” lesser-known Disney characters like Flik, Clarabelle Cow, Remy, Tweedle Dee and Tweedle Dum will appear for meet-and-greets. * During Pirate Week, the parks will have pirate bands, pirate meet-and-greets and other Arrrmazing activities, starring who else but Jack Sparrow. * On Friday the 13th, 2013 (that's September 9, 2013), Disneyland and Disneyland Hollywood studios will stay open until the 13th hour (1 a.m.), and Disney villains will host a dance party. These experiences only last a week, so if you want to experience all of them, you'll have to visit a Disney Park every week in 2013! To make things even more interesting, Disney Parks doesn't have the full weekly schedule of Limited Time Magic experiences for the public to see. You'll have to check Disneyworld.com, Disneyland.com, Facebook, Twitter, the Disney Parks Blog to find out the experience of the week, which adds to the surprise. 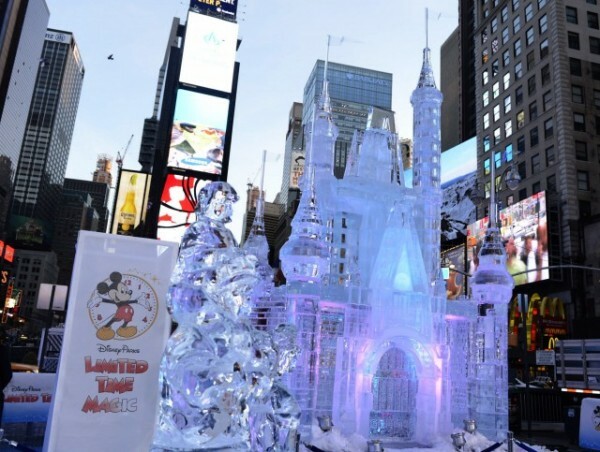 Just like the ice castle in Times Square, these Limited Time Magic experiences are memorable and wonderful, but ethereal, meaning they won't last long! CLIF Kid Full Moon Brownie ZBars are back!